I got the idea for the quilt from a pattern in the last issue of Sew Scrappy magazine, which I reviewed back in January. I have modified it so much that I think you can call the design original now. 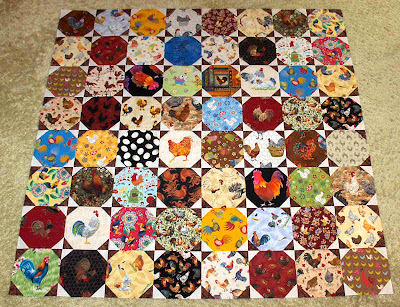 The quilt in the magazine used 8" snowball blocks, but when I looked at the scale of my fabrics I thought that 6" blocks would be better. You can see that the larger chickens are framed perfectly. There was a LOT of fussy cutting! Even the smaller chickens were fussy cut so that no heads were cut off, although there is one block where I couldn't avoid it. I will try to do less of that in future! My original plan was to do the corner triangles in black and white. I worried though, that such a strong contrast might distract from the chickens, so I opted instead for brown and cream. The contrast is still strong, but they blend quite well with the other fabrics. So I am happy with that choice. I'll show you the construction over the next few days, and hopefully by the end the top will be finished too! Looks great, Monica. I like the little cream and brown triangles.